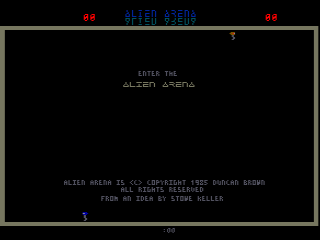 Thanks to the kind generosity of Duncan Brown, the original ROM images for Alien Arena have been made available for free, non-commercial use. By 1984, I had reverse-engineered the hardware used in Williams' games to the point where I had essentially created a "programmer's guide" for it. Destiny called, I had to write a new game from scratch for this great hardware! My original intent was to end up with a conversion kit that was more user-friendly than most (remember this was back when conversions were just starting to come into existence, long before JAMMA, and most of them were a complete mess to install). A new marquee, new side stickers, new control panel, and 12 EPROMs, and away you go! No messy wiring, board modifications, etc. My production costs would be low, my sale price could be high. 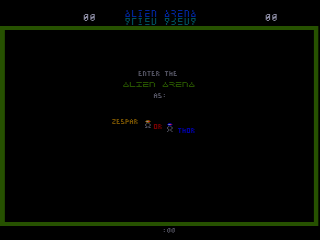 Over the course of a year, I wrote "Alien Arena". 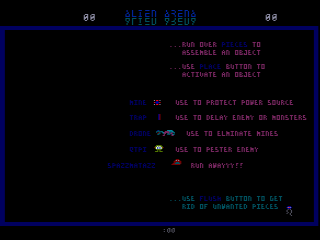 It was written in 6809 assembly language using a cross-compiler on an Apple II+. Using custom-designed and handbuilt emulator hardware (*24* 2Kx8 static RAMs on a board connected to the Apple with a custom bus interface!) I could test out my code without the slowdown of programming and erasing a bunch of EPROMs all the time. When I was done, I assembled it into an ex-Stargate cabinet, and put it out in the arcade I owned at the time. I made a few modifications (mostly to the computer-player AI) based on feedback from customers. I cannot say it was an immense hit. Most people thought it sucked, frankly. You decide for yourself. I know my wife and I had a blast playing it while I was designing it (probably added 6 months to the time to finish it, heh heh heh...). 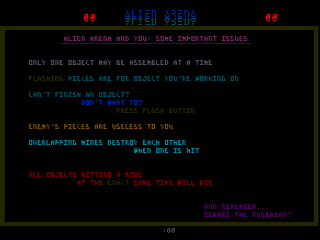 A full history of the game is available in the readme file, along with instructions on how to put the game onto real hardware. Duncan has also provided a PDF file containing a few bits and pieces of history concerning the game.